A common issue with something aspirational and very hot off the press is that everybody seems to think they know it inside out, yet very few get to reach the depths of reality. Solar too, is a victim to this. The general thought process is that, we have seen the sun right from our birth and how much more could there be about it or for that matter, about generating electricity from it? Most of you would be aware of the process but let's have a look at some of the solar energy information and facts. It is fairly straightforward that solar energy falling onto solar panels is converted into electricity and is then transmitted through transmission lines, a bit like how conventional power generated is transmitted. It sounds really simple and easy. And perhaps, that is why, a lot of people think they know solar energy facts well, but there is more than what meets the eye. Not complicated stuff like a rocket lifting off, but a little more than what the next door neighbour would tell you. No wonder, there are several things that you hear about solar systems, that cannot be further away from the truth. While we have tried to cover most of these in the form of FAQs on our site, we still thought, we will pick up the most common thoughts and facts about the solar system, that get peddled around as truth but in reality, aren’t. We plan to do this in a series format, what you see here are five popular myths around solar busted, we will follow this up with another set, and so on. Myth: Solar Power is very expensive. Reality: Isn’t it like a paradox? Solar is supposed to be cheap, given how widely the energy from the sun is available, yet the perceived notion is that it is more expensive. However, the reality is distinctly different. Unlike the traditional power generation sources, the solar industry in general has seen rapid developments. Thanks to some brilliant engineering masterminds coming together, economies of scale and other market forces, over the last decade, the upfront cost of solar has seen a steep decline. The initial cost of installation has dropped by almost 75%, which is extremely significant. The technological advancement in general has not only made the components cheaper but also more efficient and reliable. This has resulted into solar power becoming cheaper for a lot of consumers, be it residential, commercial or industrial consumers. So to think, that solar is expensive, is well, a myth and nothing more. Take for example, a typical residential consumer in New Delhi who pays a monthly bill of Rs. 5000. The savings he racks up over 25 years goes to show that solar is anything but expensive. Myth: Solar systems are high maintenance. Reality: Solar systems are made in such a way, that there are no moving parts involved. And by the laws of physics, something that is not moving will experience less wear and tear and therefore likely to last longer. Generally speaking, grid-connected solar systems need almost negligible maintenance. 8 out of 10 users that we surveyed about their upkeep habits, across various segments, stated that they casually just wait around for the rain to perform the cleaning for them! 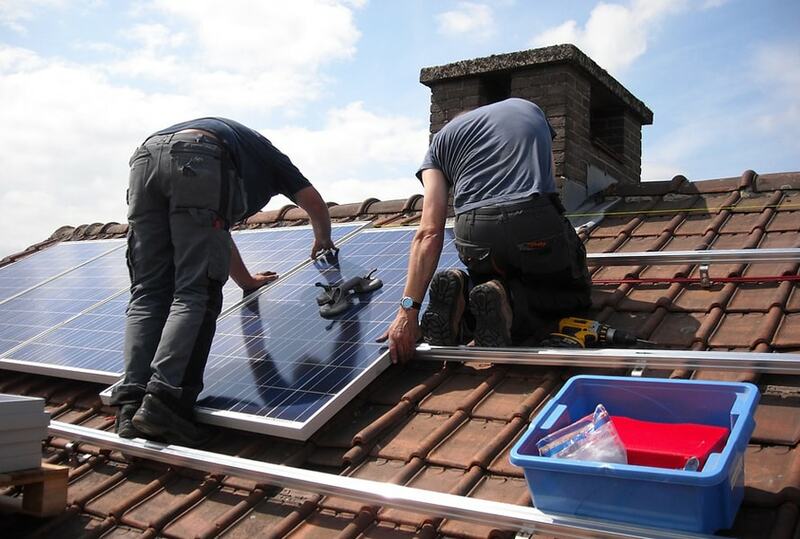 This usually leads to about 5-7% reduction in the efficiency of the panels. We obviously would not advocate a completely reckless attitude to your investment. It would be a good practice to hose the panels off, once a month, as it helps in removing any unwanted materials that may have accumulated on them over a period of time. A cursory check on the panels for any visible spots or cracks could also help in ensuring that the generation is right and within the expected range. Myth: A Solar PV system doesn’t work at all in overcast conditions. Reality: The crux of this myth comes from the fact that power generated is directly related to sunlight, right? We would be more than glad to squash this misnomer. Solar panels work just fine under ambient light aka, cloudy or not so sunny conditions. Unlike shade, overcast conditions allow at least some sunlight to reach your system. The reduction in the amount of power generated under mildly overcast to heavily cloudy situations varies between 5-10% to 60-70% of the total output, respectively. Moreover, cloudy conditions lead to a dip in temperatures of the location in which the system is located, which is actually beneficial to the system as observed in some parts of the world. Germany, anyone? Myth: Solar PV only works in areas with very high temperatures. Reality: Contrary to popular belief, solar panels work at their efficient best when the temperatures are not too hot. The science behind this is fascinating and worth reading about. Sunlight comprises of photons, that carry the requisite energy required to start the photovoltaic or PV effect. These photons transfer this energy to the electrons in the solar panels, which constitute of the solar PV cells. The energised electrons move from a state of low energy to high energy. A solar cell is designed to extract these excited electrons and run them through a circuit to produce electricity. However, under extremely hot conditions, these electrons get more excited and vibrate faster than they would normally. As a result, these electrons bump into other atomic constituents of a solar cell, converting this extra energy into excessive heat. Hence, their ability to generate electricity is reduced and this has adverse effects on the output of the solar system. Myth: Manufacturing of a solar panel creates more greenhouse emissions than it saves in the future, which kind of offsets the benefits. Reality: This is an interesting one. Sure, it is true that carbon dioxide is emitted in the production of a solar panel to the tune of about 70 grams of carbon dioxide per kWh generated. However, these panels are “carbon negative”. In fact, it takes 2-3 years to generate as much power to compensate for the amount that was required to manufacture them, and they still have another 25 years to run! Add to the fact, during their lifetime solar panels still produce less than 30 times the carbon dioxide than what their fossil fuel counterparts do and you know you are looking at an environmental friendly solution. So therefore, pretty apt to state that while solar panels may consume resources when they are young, they grow up to be magnificent adults, that help keep our environment healthy and fresh. Which of the solar myths above that we busted did you once believe in? Or is there a myth that we perhaps have not covered and missed out on? Go ahead and share it with us in the section below or catch us up on Social Media, links to which are located in the footer. We would love to hear from you.